Biz Latin Hub Representatives, Javier Alegre and Natasha Nicholas met with Germán Creimerman – an expert on immigration and the founding partner of Creimerman Law to speak about immigration in Argentina. Biz Latin Hub (BLH): What is your opinion regarding immigration trends and changes in Argentina? 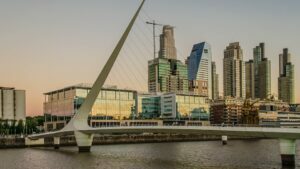 Argentina’s immigration policies have changed a lot – new immigration laws have been enacted with the intention of attracting FDI and foreign skills to the nation. Germán Creimerman: Nowadays, in Argentina, there is a lot of immigration from nearby countries in Latin America such as Peru and Bolivia. This trend has been occurring for the last twenty years. There has also been a huge influx of Venezuelans coming to Argentina in recent years, as well as going to Colombia, the United States, and Peru. Argentina’s immigration policies still recognize Venezuela as being part of MERCOSUR and as such, the immigration process for Venezuelans is not complicated. What is less common at the moment is finding immigration from North America or European countries. In the past, several decades ago, European immigration was hugely significant. With the wars in Europe, many Spaniards and Italians came over to Argentina to begin a new life. BLH: What is the current status of business immigration? Germán Creimerman: Argentina’s immigration policies have changed a lot and new legislation has been enacted with the intention of attracting FDI and showing strength and stability as a nation on the international stage, giving greater confidence to investors. Unfortunately, there is still a lot of bureaucracy and obstacles with regards to investment and when applying for visas in Argentina. Nevertheless, Argentina’s determination to attract foreign business, in addition to ‘pro-business‘ legislation has been key to recent increases in FDI. Argentina has an abundance of natural resources and a highly educated workforce. These are just two factors that have been fundamental in the increase of investment in the region. There are new prospects and opportunities being discovered in regions such as Patagonia in regards to oil, for example. What is also evident, is the increase in investment in the renewable energy sector. Additionally, there has also been diverse and large investment from China and there is an increasingly strong Chinese community in Argentina, particularly in Buenos Aires. BLH: What are the different options available for business immigration? Germán Creimerman: Companies that have incorporated a company in Argentina and wish to bring their foreign employees to work here are required to follow certain procedures to be able to do this. This includes going to an official registry to get the right visas and permits. Businesses that are already established in Argentina and who wish to bring foreign employees to work here are able to do so. The foreign employee needs a work contract with the local company which consequently permits the business to bring said employee over. A temporary residence visa is the most commonly used visa that enables foreign workers to be employed by local companies. BLH: Is the visa procedure complex and difficult? Germán Creimerman: Theoretically speaking, the Argentine government has created a type of visa for foreigners who invest in the region, but in reality, this visa is hardly used given its complexity. The procedure to obtain this type of visa is not very dynamic – it doesn’t really work. A huge amount of bureaucracy still exists in Argentina and if we as a country are seeking foreign immigration and investment, we need to rectify our immigration procedures. BLH: Would you say that Argentina has increasingly become an attractive country to live, work and invest in? Germán Creimerman: For those looking to invest in Argentina, there are a wealth of exciting commercial opportunities waiting. The opportunities available for businesses and individuals have been made easier through national legislation that actively seeks and encourages foreign direct investment. Argentina, despite having somewhat complicated immigration procedures, is one of the most attractive commercial jurisdictions in Latin America. An open-economy, diverse range of national sectors and a highly educated population (many of whom speak English) creates the perfect environment for businesses to expand their operations too. Before investing in Argentina, it is advisable to consult with a local expert. Biz Latin Hub is the trusted local Argentine partner of international companies looking to expand their operations. Get in contact today and see how we can assist you and your business.